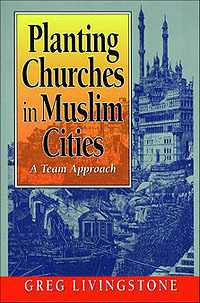 Greg Livingstone in his book, “Planting Churches in Muslim Cities” gives some great insights into the whole Islamic landscape and the importance of church planting. Livingstone’s experience with ministry in the Middle East, not only gives credibility to what he is writing about, but he gives very practical advice and solutions to see a more fruitful ministry to the Muslims. But God is doing something. Livingstone notes that God is raising up a new paradigm to reach Muslims. Rather than having a very individualistic mindset of reaching out to people, Livingstone is proposing that ministry be done in teams. He feels like this is more of a biblical model as we look into the Book of Acts. It is exciting to read about the importance of the apostolic ministry when it comes to reaching Muslims and even regions influenced by Islam. We have to go beyond the recent avenues of teaching English and even come up with new pathways to build relationships, as well as to bless the city or village. 1)	I am more Western than I would like to confess. Even though at times I pride myself in being bi-cultural, I realized that I might be more Western in my thinking compared to the culture and customs of the Middle East or in Indonesia. 2)	We really need more transcultural people to be part of future international church plants in Muslim dominated countries. I think this is where being bi-cultural is very helpful. 3)	The Jakarta team will need to train aggressively on learning how to adapt to various cultures. There are a lot of non-Western things that we have to adapt to as well as adopt in order for us to be more effective in sharing the Gospel. This is a good book to get a person’s mind thinking about doing missions through church planting, especially in areas where it is not easy to stand out as a local church. But God is moving through people who have a Muslim background but converted to the Gospel message. These are the people that are reaching out to their follow Muslim family and friends. There are some powerful testimonies. These are some of the things that we want to experience as we head out to Indonesia.